Looking to throw the ultimate Tailgate Party in the Central Coast of California? Central Coast Mobile Game Theater will transform tailgating into an unforgettable event! 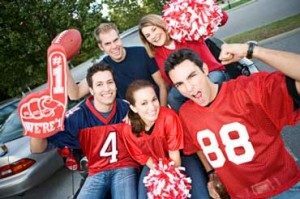 It’s the best tailgate party idea in California’s Central Coast area! First, we bring our limousine styled video game theater to your home or even to the parking lot of the big game! Inside, we provide stadium seating for 24 with a high-tech sound system and four huge HDTV’s inside. Two additional TV’s (dependent on weather conditions) outside allow up to 24 to play at once! Watch the big game and game away to your heart’s content! Our rig is equipped with a high-definition satellite dish that gets the very best sporting events. We can display that game on one or all of our TV’s…it’s all up to you! And because it’s HD (where games are available), you get that living room feeling while making it a tailgate at the same time. We’re self-powered and fully climate controlled, so we can go almost anywhere and keep your guests comfortable! Before, during and after the big game, you and your guests can play the latest multiplayer video games on our multiple XBOX One, PlayStation 4, and WiiU consoles! Worried about video game ratings? Don’t! We understand the importance of providing appropriate games for your party. When you book your party, you select games for your guests. You don’t need to worry or compromise; it’s our policy. We’re available in San Luis Obispo County and Santa Barbara County, including the communities of Grover Beach, Pismo Beach, Oceano, Arroyo Grande, Avila Beach, Nipomo, San Luis Obispo, Guadalupe, Santa Maria, Los Osos, Casmalia, Morro Bay, Atascadero, Creston, Santa Margarita, Lompoc, Cayucos, Templeton, Los Alamos and the surrounding area..
And best of all, with Central Coast Mobile Game Theater, there’s no stress and no mess! We make having your next tailgating event almost effortless. We bring the party right to you! *Plus any applicable Travel Surcharge. See our Service Area page for more information. Contact Us today. Let us know what kind of tailgate party you’d like…at your home or at the game. We’ll make sure that your event is being broadcast and we’re ready to display it on our satellite TV system. It’s the Central Coast’s BEST Party! A party in the amazing Central Coast Mobile Game Theater isn't the average birthday party...this is no boring bowling party, pizza party or teddy-bear-building party...it's a climate-controlled, luxury-limo-style video game party on wheels...that comes RIGHT TO YOU! Imagine the delight of your guests as our 24 foot self-powered, fully equipped gaming heaven pulls up to your driveway! Our Game Coach keeps the party rolling with the best games and consoles. You relax...and your home stays clean! We have the best party idea in San Luis Obispo, Santa Maria, Grover Beach and the surrounding area! Check out our FACEBOOK page for our most recent Action Packed LT & GT Party’s! 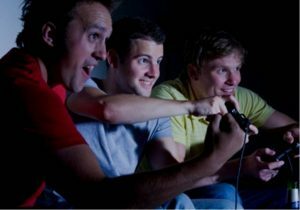 The BEST birthday party in California’s Central Coast area is a mobile video game truck party with Central Coast Mobile Game Theater!